Nine years ago this week I signed up to be a Stampin' Up! demonstrator under Mary Fish. And here I thought it would be a quiet hobby to putter with now and then. I am still a hobbyist but have made so many new friends and have traveled all over to stamping events. I had never heard of Splitcoast or Design Teams but I somehow jumped right in! And then there's this blog....who would have ever thought I would blog? Mary did - she encouraged me and helped me set it up way back when. Mary was relatively new to SU as well when I signed up but there was no doubt that she was going places. So while I puttered along Mary built an amazing team of stampers and sold over a million dollars in product. She is a wonderful upline and there are still a few of us in her downline from the early years. We have rooted for her every step of the way! I was drawn to Mary's clean, simple and oh so classy design style from the beginning. Varied Vases is her million dollar set and it is oh so Mary! I kept my card CAS as well and featured some brand new colors from SU's line. I am loving the new color refresh! I also love love love Kim's sketch this week - that's one love for every stripe! Have fun with it at Freshly Made Sketches! I love, love, love this card! That frame is fabulous, and this is a perfect card in which to pay tribute to Mary. What a lovely tribute to a lovely woman by a lovely woman! Love the way you've stamped these vases and then just stamped the sentiment right over them. Great card! What a sweet tribute to a fabulous upline! And I am pleased to cont myself among the "old" folks. My 9th anniversary will be the end of June. 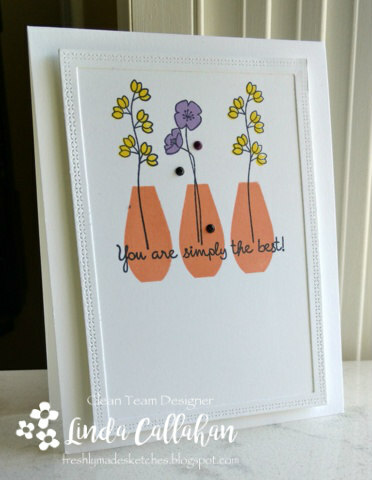 Your card is sweet as can be - love the cute frame. Wow! I'm overcome with emotion and gratitude. I remember the day we discussed you joining and look where it has brought us both. The card is absolute perfection and your signature clean style! 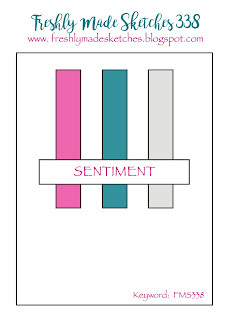 I don't know Mary, but your cards are always among my favorites, Linda … this is no exception! Love your tribute to Mary Linda! Sweet card! Love the colors and it definitely says "Mary"! Happy Anniversary, Linda!! My 9 years was in February! 9 years! What a great achievement and what a wonderful tribute to Mary. Your card is gorgeous. A beautiful card, Linda...and a beautiful post! Hugs from one of the "Oldies"! Linda, this card is fabulous and oh so sweet! I loved your blog post and congratulations on your 9 Years! I am so lucky to have met you and I hope to see you in O-Town this year! Love this card Linda! Those vases are amazing and I love the flowers! The border is fabulous too! Congrats on your 9th anniversary! Loved reading the story of how you signed up! Well look at you. You totally nailed this sketch - and after a few doubts I might add. You worry too much! This design is fabulous - as well as your colors. I love how your vases turned out - such a wonderful placement of vases, stems and sentiment!